Fox’s “American Idol” is in Howard Stern’s crosshairs. The show with the most dominant ratings in broadcast television history is in danger of being “ruined,” according to the satellite shock jock. The toilet tongued Stern has been working with Web site votefortheworst.com and using his radio platform to try and persuade his listening audience to follow the dictates of the site, which advocates that “Idol” viewers vote for the poorest performer on the show. The designated contestant of the current season is an atonal, arrhythmic, androgynous singer named Sanjaya Malakar. Malakar has inspired tears, endless Internet chatter, late-night comedy ribbing and a direct threat from curmudgeonly judge Simon Cowell. Fans of Stern have demonstrated cult-like tendencies in the past, as listeners appear to follow the dictates of their leader. He has even thrown his weight around in statewide elections in New York. Malakar was in the bottom two or three of “Idol” contestants during the initial episodes of the show. But he was noticeably absent from the lower vote-getter categories in those telecasts that took place after Stern started to focus on his get-out-the-vote effort in March. With over 30 million people tuning in each week, other networks are likely pleased with Stern’s campaign and heartened by the fact that this year’s “Idol” ratings are down 10 percent. Since the actual vote tallies are not released to the public, exactly how many voters Stern has managed to corral is unknown. Malakar does have his own fan base and is also being covered extensively by Indian media. Fox has issued a statement on the matter, expressing its skepticism of Stern’s actual impact on the plurality of the vote. In private, though, Fox execs’ fingers must be crossed that Malakar is booted sooner rather than later. John Travolta preached to Brits, asking them to “do their bit” to reduce global warming, while admitting “I fly jets,” according to the London Evening Standard. He talked about using “alternative methods of fuel” to help the environment. The former Vinnie Barbarino owns five jets and his own private runway. During the last year he flew 30,000 miles and produced an estimated 800 tons of carbon emissions. Perhaps drawing on his religion, Scientology, Travolta said that the solution to global warming could be found in outer space. 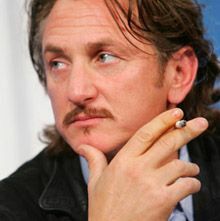 Wondering where Sean Penn has been? The Oscar-winning actor recently surfaced at a town hall meeting. Penn was evidently emboldened by events of the day before in which the House voted 218-212 to withdraw troops from Iraq by September 2008. Hundreds gathered at the meeting to get an earful of anti-Iraq war talk. They would not be disappointed. Penn was present along with Democrat Rep. Barbara Lee, a member of the Out of Iraq Caucus. Maybe the many “Impeach Bush” signs that were displayed by people outside that inspired Penn to let the insults fly like a pizza pie. While Rep. Lee told the crowd that the war was “illegal and unwinnable,” Penn tried to finesse the support of the troops as he proceeded to undercut their mission. Nice to know Penn was educated in the classics at Ridgemont High. Expect the courtroom to be standing room only when the press of the world crowd in to report on the murder trial of legendary record producer Phil Spector. Spector is accused of killing movie actress Lana Clarkson. Jury selection begins this week for those who will decide whether on Feb. 3, 2003, the reclusive Spector murdered Clarkson after bringing her from the House of Blues to his home. Clarkson acted in Roger Corman’s cult film “Barbarian Queen.” She was working as a hostess at the House of Blues when she was spotted by Spector. Spector’s chauffeur, Adriano De Souza, told a grand jury that Spector had said, “ I think I killed somebody,” and that Spector had emerged from his home with blood on his hands holding a gun. The court battle will center on the question of who pulled the trigger. The coroner’s office noted that Clarkson had gunshot residue on both of her hands and may have pulled the trigger. A slew of forensic scholars is expected to demonstrate expertise in front of the jury. Spector has pleaded not guilty and has remained free on $1 million bail since being arrested after the shooting. If convicted, he faces life in prison. Evidently, Superior Court Judge Larry Paul Fidler didn’t learn much from the O.J. debacle. He has decided to let the trial be televised. Filmmakers Debbie Melnyck and Rick Caine set out to film a biography of someone they truly admired. However, while producing “Manufacturing Dissent,” the two made a discovery that their hero, Michael Moore, was far from the person, or for that matter the professional that they had imagined. During their movie making experience, Melnyck and Caine learned about Moore’s fabricated persona; in particular that he did not grow up in working class Flint, Michigan, but in Davison, a wealthy nearby suburb. They discovered that Moore was not removed as editor of Mother Jones for political reasons as he has claimed, but was fired for bad editing. They learned that Moore shot footage of himself and interspersed it with other events to imply things that never actually happened (such as Moore asking Roger Smith, former CEO of General Motors, a question at a shareholders’ meeting). Other well-known documentary filmmakers such as Errol Morris (“The Fog of War”) express disdain in the film for Moore’s documentary style. By evading interviews with the filmmakers, Moore and his staff behave like the corporate targets that Moore despises. At one event, the filmmakers’ soundboard is unplugged while other reporters are allowed to tape. At another event, a staffer kicks the filmmakers out of an arena and throws their camera to the ground. Because the criticism of Moore comes from self-described “progressive liberals,” who were originally motivated by their admiration for Moore before they reluctantly concluded that he was not what he appeared to be, the mainstream press are actually treating the film differently than similar polemic material from the Right. – “Filmmakers question Michael Moore’s tactics,” A.P. Moore’s talent has been to bring humor, a brisk pace and controversy to the documentary genre. “Manufacturing Dissent” demonstrates that Moore also brings fabrication. Maybe now there will be more skepticism about Moore from left-of-center folks who in the past refused to question his work. Liberal dream girl Valerie Plame was a recent witness in a staged Capitol Hill production put on by Democratic Bush haters. The sometimes spy acknowledged things that were already known, like the fact that she and hubby Joe Wilson are die-hard Dems. Interestingly, the former ambassador’s wife was never asked about the central issue of the investigation that claimed “Scooter” Libby for a collateral offense. Plame was not specifically asked whether her status was, in fact, covert, within the meaning of the Intelligence Identities Protection Act. Plame predictably claimed that her work was covert despite the fact that she was listed under Wilson’s listing in “Who’s Who in America.” Using the phrase “I’m not a lawyer,” Plame described her work status without reference to the statute. As Bill Gertz reported, Plame’s cover was actually exposed by a Russian spy in the 1990s. The CIA had sent classified documents to the Swiss embassy in Havana where Cubans got a hold of Plame’s name. Criminal lawyers in D.C. know that if Plame’s job fell within the parameters of the statute, eager-beaver special prosecutor Patrick Fitzgerald would have made a beeline to indict the guy he knew had revealed Plame as Wilson’s wife, then-Deputy Secretary of State Richard Armitage. The truth is, there is nothing covert about Plame and Wilson. They have sought publicity and money ever since they became cause celebs of the Left. Keeping themselves overtly in the public eye, they posed for the cover of Vanity Fair, negotiated book deals and a Hollywood production contract, and became multimillionaires. Tom Cruise and Sumner Redstone Friends Again? Evidently, Viacom chairman Sumner Redstone wants to be Tom Cruise’s bud again. A while back Redstone publicly severed the business ties between Cruise and Viacom-owned Paramount Pictures, citing the actor’s eccentric behavior and Scientology-based feud with Brooke Shields. Cruise has since taken the position of heading well-known Hollywood studio brand United Artists. The two former pals reportedly haven’t spoken since the falling out. Redstone even attempted to downplay Cruise’s embarrassing eviction from the Paramount lot. “What happened was, I just gave an interview to The Wall Street Journal. In the course of it, they asked me what was going on. I said, ‘You know, he would no longer be in the lot,’” Redstone stated. “They treated that like I was firing him. I didn’t fire him! I had nothing to do with it. But they treated it explosively. And I didn’t like it,” Redstone said. Warner Bros. has acquired the life rights of ex-CIA agent Valerie Plame and husband Joseph Wilson. The studio is reportedly developing a movie that will tell the story of Plame’s supposed outing. Plame’s upcoming book “Fair Game,” for which Simon & Schuster reportedly paid Plame an advance in the neighborhood of $2.5 million, will be the basis for the feature. There’s one glitch that may give Plame and her Hollywood friends a headache. Before her work can be published or made public in a film, the CIA has to approve. Hope the CIA opts to preserve Valerie and Joe’s privacy and nixes both projects.